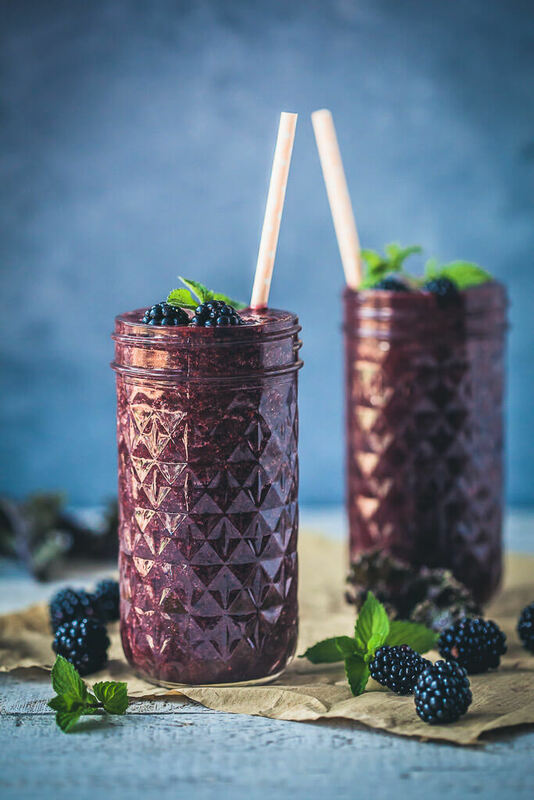 A Quick and Healthy drink, this Blackberry Kale Smoothie is packed full of vitamins and antioxidants, dairy-free and vegan! Peel peaches, slice and remove pit. Put peach slices into a blender. Wash purple kale, dry and remove tough stems. Place kale into blender. Add blackberries, blueberries and juice of half a lemon. Add some water, as needed. Blend until smooth. Check smoothie thickness and if needed, add more water (and pulse to mix). Pour smoothie into glasses or jars, top with some blackberries and mint leaves and serve.